A few months ago, I spent a morning in All About Pets Too, a small pet store in Red Lion. It’s a small shop, but it offers supplies for all kinds of pets and is home to three roaming cats, three squawking birds and a small pond of fish, plus other animals that are for sale. In the short article I wrote to accompany the pictures I made, I compared the store owner, Tammie, to an American Doctor Doolittle, as she spent most of her daylight animals surrounded by animals. © 2015 by The York Daily Record/Sunday News. 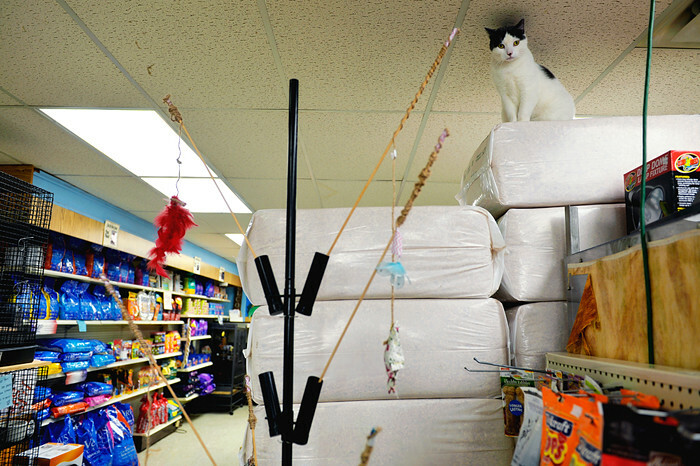 Max, one of three store cats, watches goings-on from his perch on stacks of pine bedding on Wednesday, Feb. 11, 2015, at All About Pets Too in Red Lion. Co-owner Tammie Arnold, who has operated the store in various locations for 22 years, has provided grooming and nail-trimming services, and now offers same-day delivery service as a way to compete against big-box stores that carry pet food. “It’s been up and down, but we’ve survived,” she said of the store she co-owns with Jennifer Warfel. © 2015 by The York Daily Record/Sunday News. 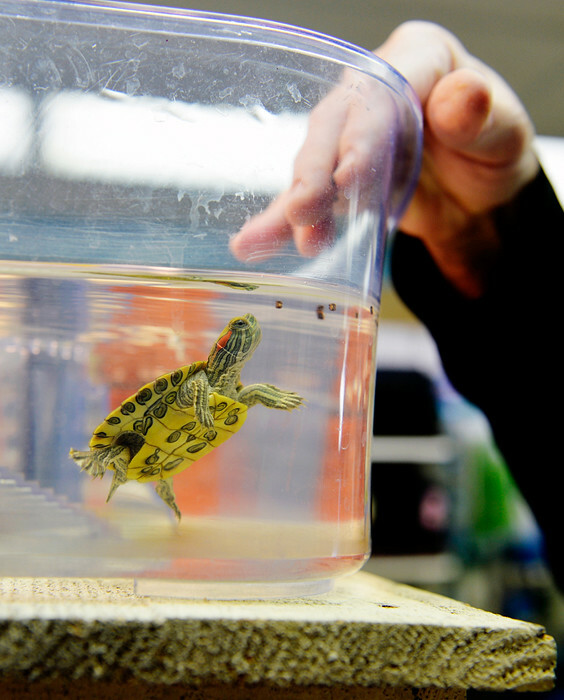 All About Pets Too co-owner Tammie Arnold feeds a turtle on Wednesday, Feb. 11, 2015, at her pet store in Red Lion. Every morning an hour before the store opens, Arnold arrives to feed the various pets and clean up from the previous night. © 2015 by The York Daily Record/Sunday News. 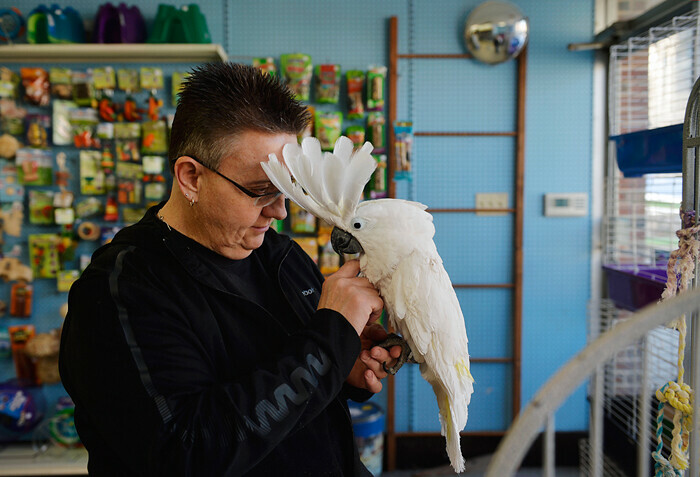 All About Pets Too co-owner Tammie Arnold greets Salso, an 8-year-old umbrella cockatoo who is one of the three store birds, on Wednesday, Feb. 11, 2015, at Arnold’s pet shop in Red Lion. Salso’s cage is close to the front door, where he can greet customers. © 2015 by The York Daily Record/Sunday News. 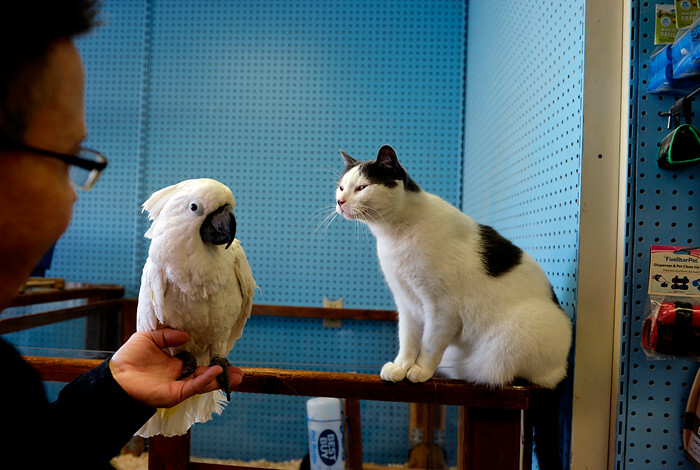 All About Pets Too co-owner Tammie Arnold holds out Salso, an 8-year-old umbrella cockatoo, to greet Max, one of three store cats, on Wednesday, Feb. 11, 2015, in Red Lion. © 2015 by The York Daily Record/Sunday News. 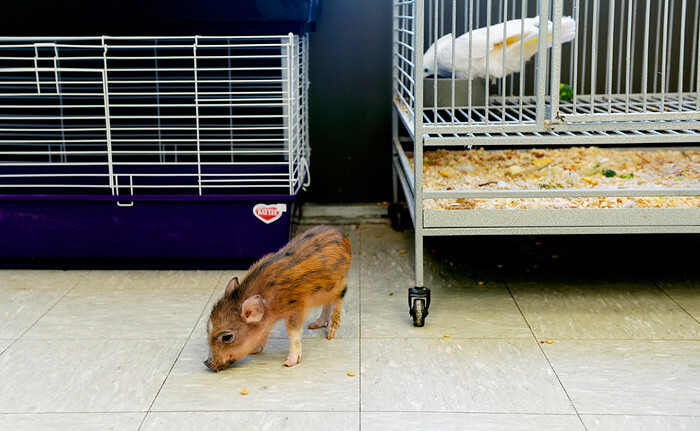 A micro potbelly pig eats food thrown to him by Salso the 8-year-old umbrella cockatoo on Wednesday, Feb. 11, 2015, at All About Pets Too in Red Lion. © 2015 by The York Daily Record/Sunday News. 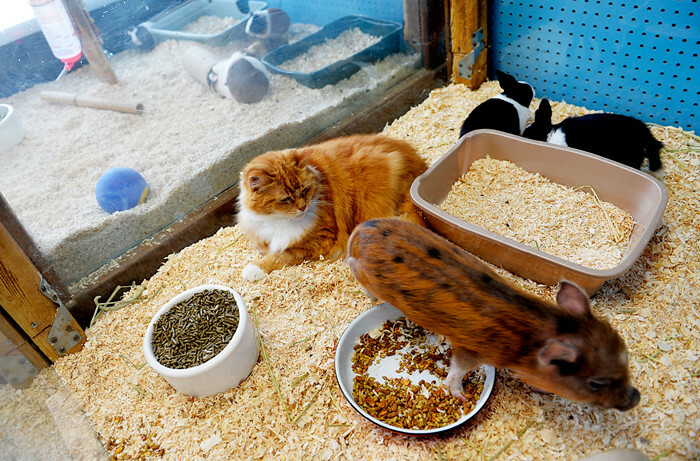 Tiggie, a 10-year-old cat, sits in an open-top pen with a micro potbelly pig and two bunnies on Wednesday, Feb. 11, 2015, at All About Pets Too in Red Lion. Tiggie, one of three store cats who are free to roam, changes her nesting spot every few weeks and has recently settled in with the smaller mammals. © 2015 by The York Daily Record/Sunday News. 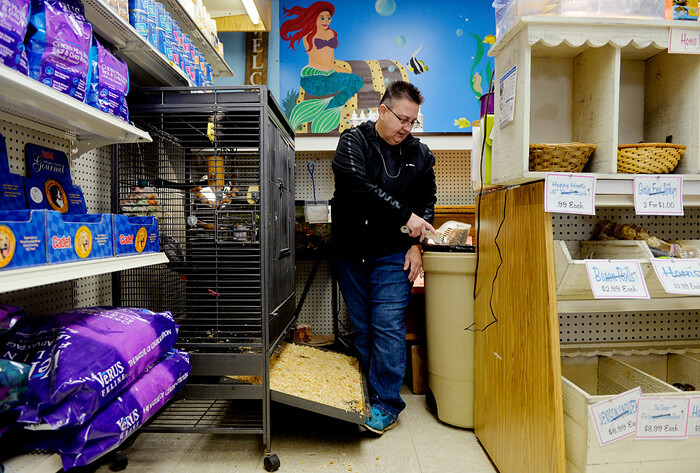 All About Pets Too co-owner Tammie Arnold cleans out the cage of Buddy, a 22-year-old African grey parrot on Wednesday, Feb. 11, 2015, in Red Lion. © 2015 by The York Daily Record/Sunday News. 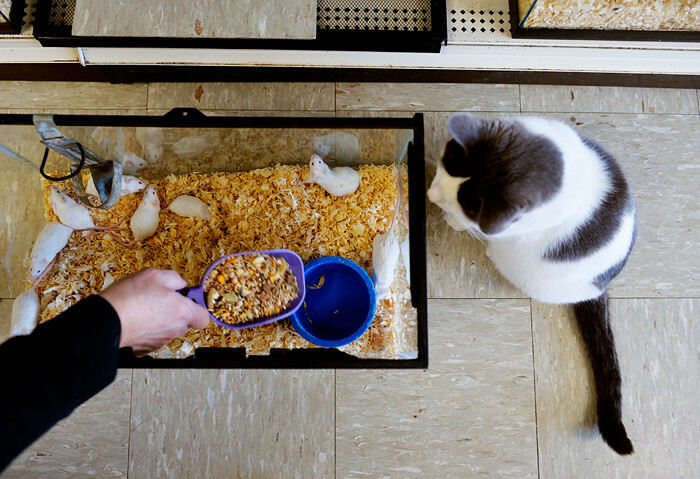 Max, one of the three store cats at All About Pets Too, watches as store co-owner Tammie Arnold feeds the mice on Wednesday, Feb. 11, 2015, in Red Lion. © 2015 by The York Daily Record/Sunday News. 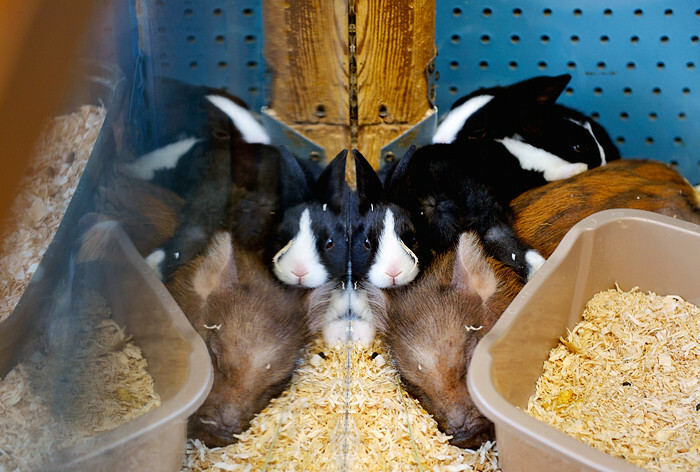 A bunny and a micro potbelly pig snuggle up together for naps in an open-top pen on Wednesday, Feb. 11, 2015, at All About Pets Too in Red Lion.